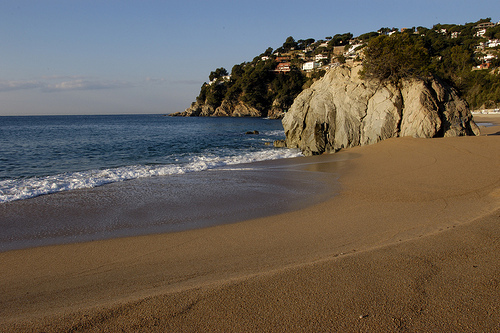 Cala Canyelles has the distinction of having, at its right end, to the south, the only harbour that you find in Lloret. This is a small pier that accommodates only small vessels, most sport boats. 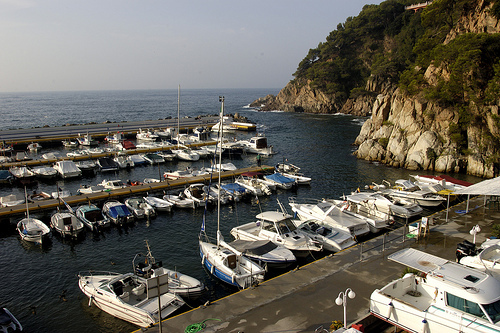 Associated with him is the Yacht Club Cala Canyelles. The sand of the cove is thick and golden coloured. Its length is over 400 meters and has a width of about 40 meters. Canyelles is an urbanized cove and is equipped with all the amenities you would expect of a large creek. So in addition to bins, showers footbaths, cleaning services, parasol and hammocks rental, kiosk and restaurant, it has surveillance and first aid services during the summer season. 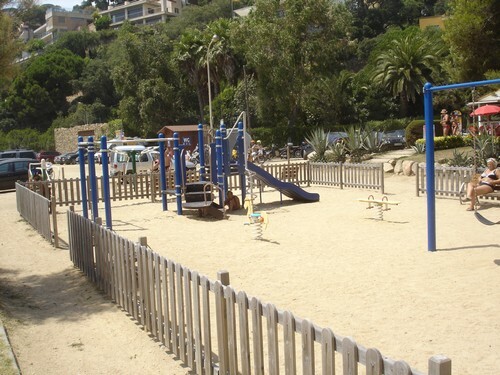 It also has a small playground where children can play when they want to switch the water games. 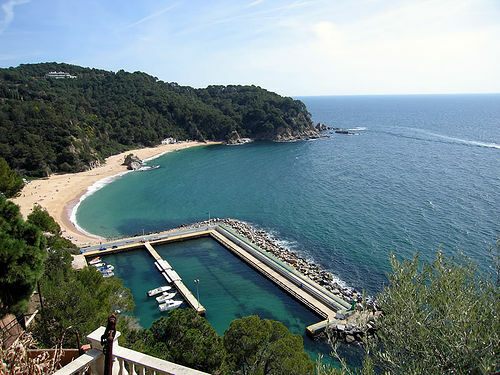 To Cala Canyelles arrives the tour boat lines, many of them with underwater views, that allows to tour the coastline of the Costa Brava from Blanes to Sant Feliu. On the beach there is a point of information and ticketing. As can be seen in the photographs Cala Canyelles is divided by a set of two large rocks in its center. Many swimmers love to extend the towel in the shade of these rocky outcrops that have the particularity to host pines on their summits, about 10 meters high. The rocks also reach the sea and children and adults love snorkeling in search of tiny life forms around them. From this part of the beach on the left side, where the snack bar, the number of bathers is generally lower, as it is located a little further away from the main entrance of the creek, the park and the marina. 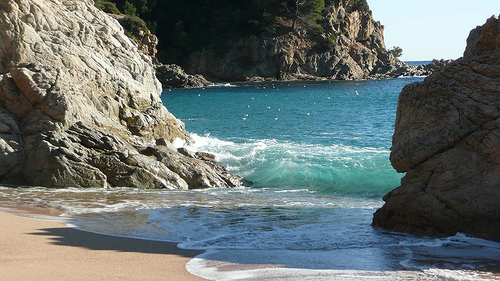 Access to Cala Canyelles is really easy, just have to take the road of Tossa de Mar and swerve right at the moment you see the indication of the cove. Creek also has parking, so hopefully if you go to this beach high occupancy, even in high season, you can park. 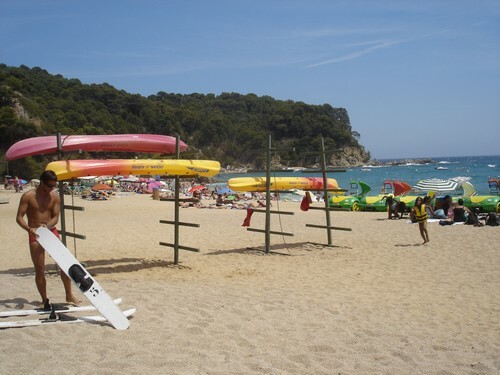 Thus, the Cala Canyelles, in Lloret de Mar, awarded with the blue flag, is one of those great beaches of the Costa Brava with a lot of services and perfect to meet the needs of a large family beach day.